The ISA bus - the original bus used in PC/104 - is still going strong. In contrast to the design challenges posed by PCIe and PCI, the ISA bus is extremely easy to design with, making it not only possible to easily design your own I/O board, but also to purchase a wide variety of I/O boards from vendors who also continue to benefit from the simplicity of ISA. The introduction of the EMX form factor and I/O module connector specifications bring the advantages COM Express and Qseven modules together into the industry’s first standardized COM-based SBC. This size-efficient, cost-effective standard offers clear advantages over existing SBC and COM form factors, while providing plenty of I/O flexibility for today’s applications and future developments. Praise the good old days of PC/104! The ISA bus was the expansion method of choice, processors consumed modest power levels, and chips boasted long life cycles. 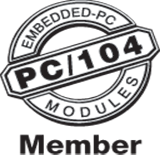 Nowadays, PC/104 technology advances quickly and in many different directions. The consortium and its board of directors have been instrumental in continuing to maintain the core mission of the organization while adapting to the changing environment and the needs of members and end users.